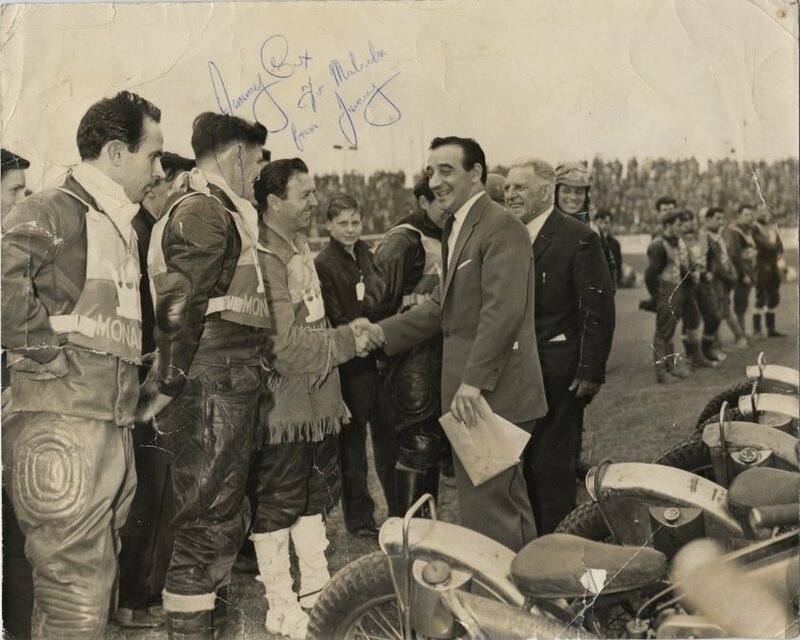 Speedway finished at Old Meadowbank in 1954, and there were no meetings until the two Students' Charities meetings in 1959 and 1960. These were not srictly speaking Monarchs' events, but the team proper returned with Ian Hoskins promoting in the Provincial League of 1960. The first home match was on 7th May against Liverpool Pirates, and this shot of the parade was taken that night. The Pirates are at the far end, while celebrity guest Larry Marshall meets the Monarchs assisted by Johnny Hoskins. STV star Marshall is shaking hands with Jimmy Cox, and to Jimmy's right you can see Willie Templeton and Gordon Mitchell.